This is a repost of a review which ran back in 2010. This is an awesome little thriller that you'll be able to see when the film plays the final weekend of this years New York Film Festival which starts tomorrow. I highly recommend seeing it at the festival because of the film was shot in a beautiful wide screen. I have no idea if this film is in the Turner Classics rotation. I know its not on official DVD since I picked this up from a dealer at a nostalgia show. Unfortunately its a pan and scan copy which means the wonderful widescreen that you see fleetingly during the opening and closing credits is completely missing for the body of the film. This is a film that needs to be seen by more people and needs to be out at the correct aspect ratio. Van Johnson is a blind playwright in London. Cranky since he lost his sight he lives a reclusive existence having driven away anyone who cared about him. He's helped along only by his butler. One day when he wanders off to a pub he overhears a conversation that leads him to believe that a terrible crime, a kidnapping or murder, is going to take place. When his call to the police gets him nowhere, he decides to stop the crime himself; or rather with the aid of his butler and his ex-fiance. 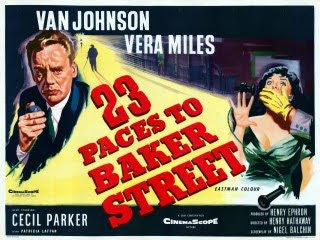 This is a nifty little thriller that is akin to Hitchcock's films of the 1950's. While it echoes Hitchcock's work it is decidedly its own beast with the plot and events playing out in ways that Hitch never really explored. Johnson's blindness is both a blessing and a curse and a good chunk of the tension comes from not knowing if he's in over his head. The plot is nicely crafted so that, like Johnson and his companions, we are not sure what exactly is being planned. We, like the characters on the screen, have to piece things together. Its so nice not to have everything spelled out at the start or to have a big reveal moment too early in the tale. The whole cast are very good with everyone nicely filling out and selling their assigned roles. If there is a problem with the film its that film has the feel of some of the big budget films of the 50's that were made in color and on location so that people would be lured back to theaters in order to see things they couldn't get on TV. Its often too "big" for some of the small moments with shots set up to look good in widescreen, but almost at the cost of the story. Still its a minor complaint and the film looks good in the full screen edition I saw. This is one to look out for, especially if you're a Hitchcock fan, since it appears to be an under appreciated thriller.